It’s 2019 and everything can be outsourced. We’re not talking about outsourcing through Upwork or Fiverr. We’re talking about outsourcing to data analyzing websites, content curating apps, and graphic design platforms. What if your entire business could run fluidly while you focused on the day-to-day actions that moved you towards your KPIs? That’s the goal of this article. We want you to walk away with at least three new apps that could change how you run your business and how you’re going to scale in 2020. Here are the 25 best business apps for small businesses. According to Quickbooks, small business owners can save an average of 42 hours per month using this app. Quickbooks connects to your business, or personal bank account and/or credit card, and let’s you systemize transactions as personal or business income or expenses. They’re also partnered with TurboTax so you can see how much you owe in quarterly taxes based on your current income (minus expenses in real-time). The app features project tracking, bill management, mile tracking, income and expenses, invoicing and payments, contractor management, and employee payroll. Expensify is receipt and expense management app for businesses that don’t need the full suite features of Quickbooks. Expensify features include one-click receipt scanning (SmartScan), next-day reimbursement that delivers money to employees within 24 hours, automatic approval workflows to automate expenses, and automatic account syncing for real-time finances. Docusign is an e-signature platform for small businesses that send and receive contracts regularly. The app allows small business owners to prepare, sign, act on and manage all documented agreements. Docusign is partnered with Salesforce to help users create agreements like non-disclosure agreements, quotes, proposals, and invoices. Gusto is an app for small businesses that need employee benefits and HR services. The app handles payroll, health benefits, PTO, time-requests, time tracking, and access to HR professionals. Gusto integrates with FreshBooks, Xero, QuickBooks, Homebase, Time Tracker and more. Nutshell is for small businesses who need customer reporting, sales process management, and reporting tools. It also lets business users map out their business opportunities and see their customer’s social profiles using their Nutshell Intelligence. The app integrates with MailChimp, Slack, Quickbooks, Unbounce, PandaDoc and other business tools. One-click integrations with MailChimp, Slack, Quickbooks, Unbounce, PandaDoc, etc. ForceManager is for small businesses who need help with customer acquisition, growth, and channel management. They help field sales teams capture information, plan sales campaigns, schedule follow-up meetings, and see data insights. In short, ForceManager is your sales virtual assistant. Pipedrive is for small businesses with sales teams that need to manage a large number of customer relationships. According to Pipedrive, on average their users close 28% more deals after using Pipeline for a year. Similar to Brief, their focus is on simplicity. They created their app around the features that create impact, not aesthetics. 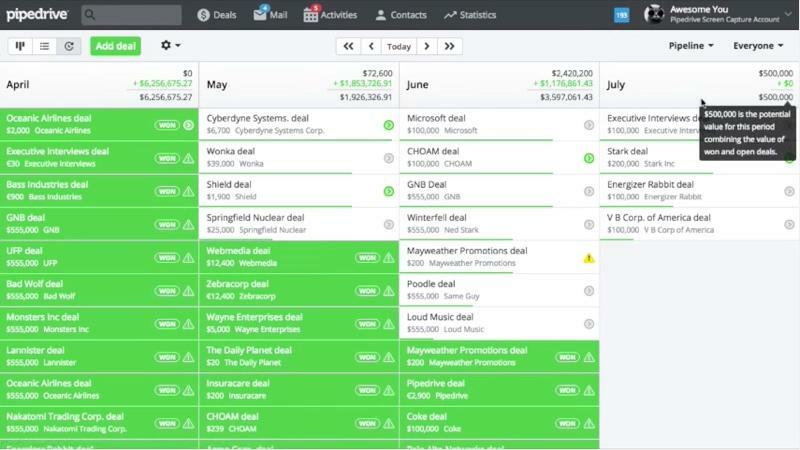 Pipedrive tracks emails and calls and shows sales reps a streamlined view of their sales process. Calendly is an appointment scheduling app for smalls businesses that don’t need anything more than an automated scheduler. The app lets you create events and then choose the day and time slot for the event (recurring or one time). Calendly syncs with your calendar app to automatically put all new events in your main calendar and can send confirmation notifications via email or text. You can also accept payment through the app. Hootsuite is a social media management platform for small businesses. The app lets users manage several networks and profiles, schedule posts, and spend up to $5,000 per month on paid social media ads. You can also monitor topics related to your industry and assign team members tasks within the app. Hootsuite also has custom analytics to show you the social posts creating the most engagement on Instagram, Facebook, LinkedIn and Twitter. BuzzSumo gives small businesses insight into what’s trending in their industry and online. The app is available for free for a limited amount of searches. BuzzSumo also has a brand monitor feature that alerts a business when their name was published online, a question analyzer to find popular questions being asked by your target audience, and a Facebook post analyzer to find the post with the best engagement. Find popular questions asked on forums, e-commerce websites, Quora, etc. SEMRush is an insight tool small businesses can use to improve their online visibility and analyze their marketing efforts for efficiency. The app shows small businesses competitor data such as the keywords working best for them, their ad budgets, the copy they are using on their landing pages and more. 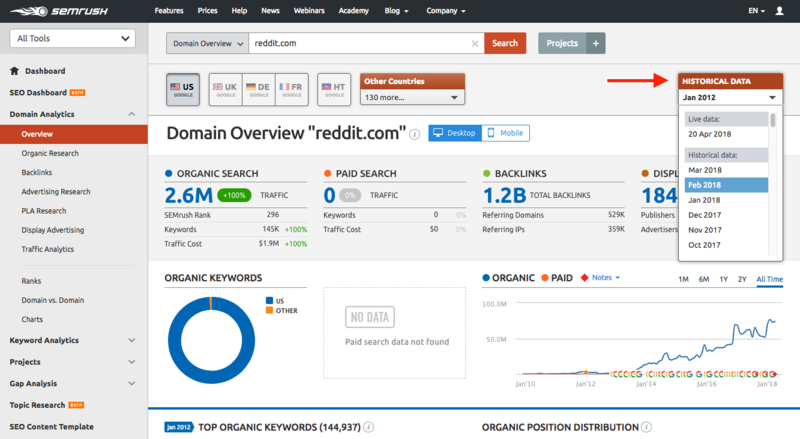 See competitor’s traffic sources, rankings, social media results, etc. SurveyMonkey is an online survey tool for small and large businesses. The surveys can be used to get feedback from employees and customers. SurveyMonkey also offers online polls, has 200 example survey questions, and a margin of error calculator. Answer Dock is an analytics app for small business owners who want to quickly find specific data about their business. The app features a search bar that you can type in the data you are looking for and the app will find and graph the data for you. Answer Dock works across retail, ecommerce, transportation, healthcare, finance, insurance, communications, and media. The app offers a one-month free trial and then three pricing options. Brief is a productivity and collaboration app for entrepreneurs, founders, and small businesses. The app is designed to increase focus and team efficiency through its sleek interface. Brief combines team chat, task management, video calls and file sharing into one elegant dashboard, letting small business owners run their business without a hitch. Team members can assign tasks to themselves and other members and create different Hubs depending on projects and departments. The app saves all shared files and stores them in a secure and searchable virtual file cabinet for easy access from any device. Deemed as “the best note-taking app”, Evernote is an app to keep notes and content organized for easy future access. Small businesses use Evernote to save ideas and project in notes, voice and picture. It can also be used as a collaboration tool to manage deadlines, clients, and meetings with a team. Zapier is an app for small business owners who need to integrate information between web apps. For example, when you receive a new email with an attachment in Gmail, the attachment will copy into Dropbox and then you’ll be notified on Slack about the new files. Zapier is designed to automate the small taks so business owners can focus on the larger ones. Time Doctor is for small businesses that have contractors or remote employees who’s time they need to track. Their users have reported a 22% average increase in productivity from time logged through the app. The app feature automatic screenshots, reporting, chat monitoring, web app usage, processes payroll and more. RescueTime is for small business owners who need to track their own time to improve their productivity. The app helps its users understand their habits so they can increase their efficiency and create more growth in their business. 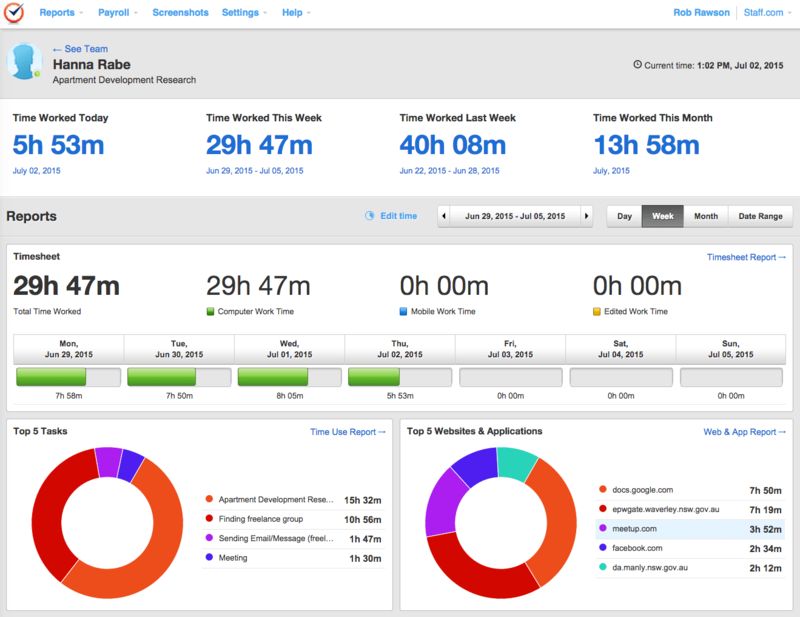 RescueTime runs in the background on computers and mobile devices, tracks how much time is spent on websites and apps, and then provides a detailed report. Track time spent in meetings, phone calls, etc. 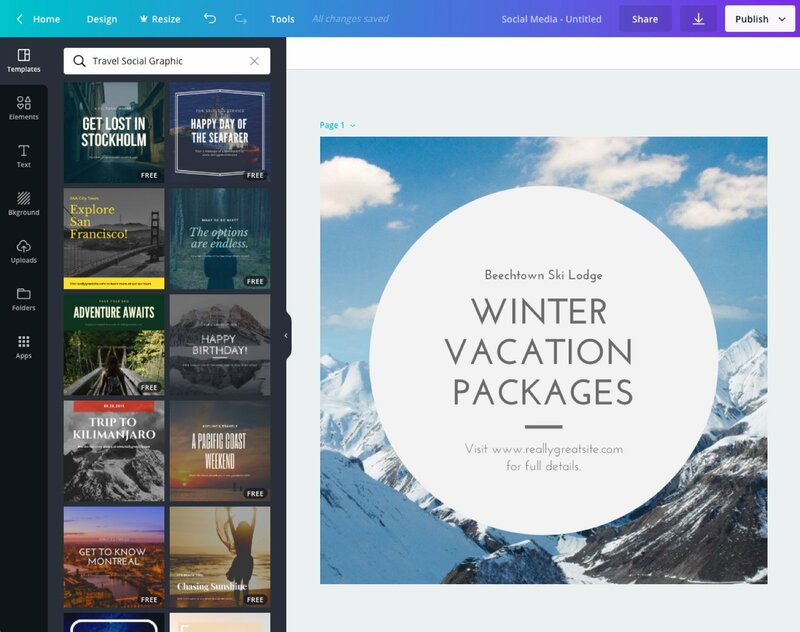 Canva is a graphic design platform for small business owners. The app has templates, background images, stock photos, icons, and elements that can be used to created social media or website images. Users can upload their own images as well and customize each template to fit their brand. Canva is perfect for small business owners or team members with minimal graphic design experience. 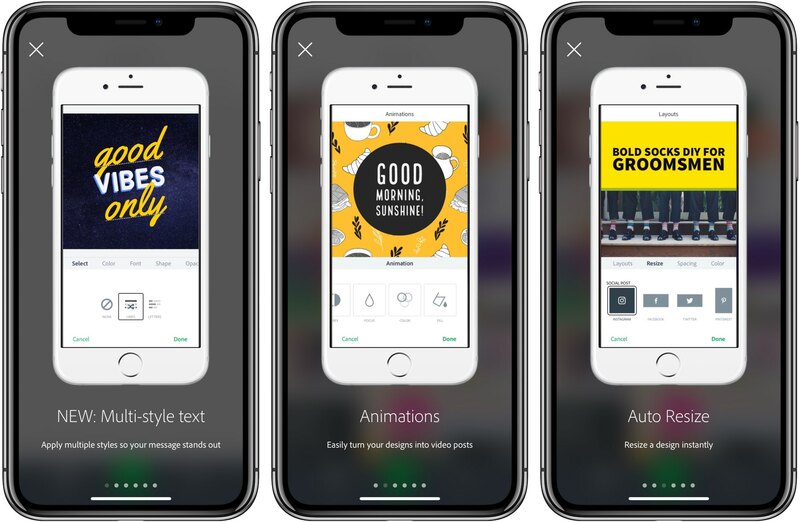 Adobe Spark Post is a design app for creating social media posts, and especially Instagram stories, for your business. The app features edits that create a professional look with minimal effort using their templates and pre-made animations. Over is a design app for creating social media posts and ad campaigns. What we love about Over is their purposely minimal design templates. The app features branding uploads such as logos, fonts and colors and trendy stock videos and photos to choose from via Unsplash, Google Images, and Pixabay. Over has a free plan and in-app purchases for stock photos and videos and customizations. Their paid plan option is $14.99 per month or $99.99 for a year and all-access to their customizations. WordPress is the website creation and hosting platform for small businesses who have prior website building experience or are outsourcing their website development. It’s possible to build a WordPress website without prior experience, but website builders like Squarespace and Wix (mentioned below) are better suited for a business needing a simple website with small customization needs. 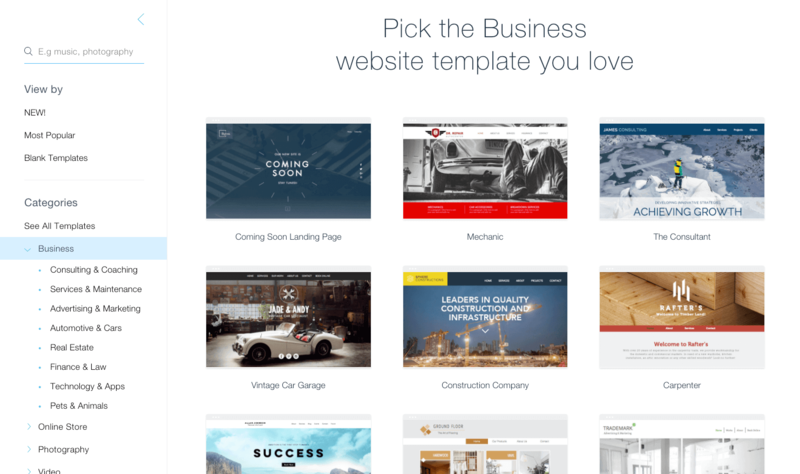 Squarespace is a website creation and hosting platform for small businesses that don’t need a customized website and want to build it themselves. The app has easily customizable templates to drag and drop copy text and photos. It also has built in form integration with MailChimp and an e-commerce platform. Wix is a website builder for small business owners who are looking for customizable options between WordPress and Squarespace. 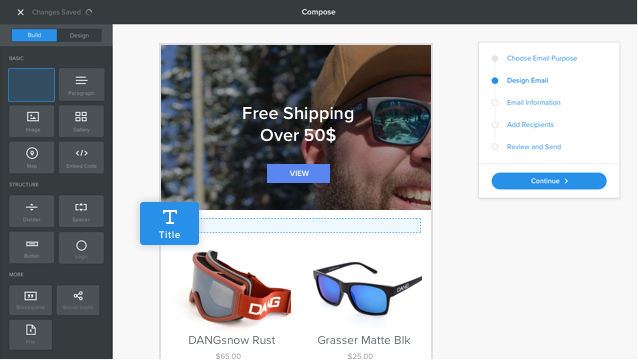 Wix uses templates just like Squarespace, but their design interface gives users more customizing options and freedom. Unlike WordPress, Wix can be used by a novice website builder to create a professional and fully functioning website. Weebly is an ecommerce website platform similar to Wix in customization capabilities. They offer professional product photos and ecommerce tools for order management, shipping and payments. Weebly integrates with Facebook ads and email campaign tools to make marketing as seamless as possible. What are your three biggest pain points and what apps seems to be the ultimate solve for you? Join Brief for free today. A productivity app that focuses your day to achieve more. Its minimalist dashboard combines chat, video, team hubs, to do lists, file sharing and storage. © 2019 Brief COMMUNICATIONS INC.